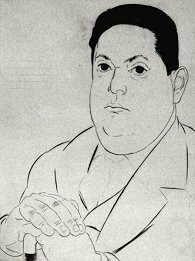 Darius Milhaud (above) was born in in Aix-en-Provence in 1892. From 1947 to 1971 he taught alternate years at Mills College in Oakland, California and the Paris Conservatoire. If you enjoyed this post take An Overgrown Path to Is classical music too fast? more and more notable as the years pass. Thanks for mentioning Stanley Hollingsworth. I studied with him in the late '70's, and he was a great teacher. The link on his name is attached to Mr. Glass - I'm not sure if that was intended, or if there was another destination planned. If there is a website out there about Stanley, I'd love to see it. I always find it fascinating to see who are the current Visiting Darius Milhaud Professors of Music at Mills College. For the Fall of 2006, the Visiting D.M. Professors of Music are Pauline Oliveros and Joëlle Léandre. For the Spring of 2007, the Visiting D.M. Professor is Hilda Paredes. I also see that British composer and improvisor Fred Frith, on the Mills College Music faculty since 1999, is now the Luther B. Marchant Chair Professor of Music. Athenophaistos, thanks for your comment, and apologies for the error on the Stanley Hollingsworth link which is now rectified and points at a useful biography. So many links, and so many opportunities for errors .... sorry about that. My wife's grandmother studied piano with Milhaud at Mills. She has some old newspaper clippings of him instructing her at the piano. A friend recently completed a Master's at Mills in music, and he seems to be more prepared for the 21st century than the products of conservatories that I see.